Those of you that are regular readers will know that one of themes that came through in the blog in my history of the firm was how we were consistently able to gain the opportunity to design new and unusual project types such as the Tropical Rainforest pavilion at the Franklin Park Zoo, a T station, a hotel in Italy, and an interfaith center. I also told you in January that after writing every week for the previous year that I would open it up to others in the firm to contribute to the blog. This month’s post is a combination of that theme and this year’s idea. Asked by Boston College to convert the former Cardinal’s residence on the Brighton campus into a permanent home for the McMullen Museum of Art and a conference center, not because we had ever done one before (note the recurring theme), but because they trust us to deliver without letting our ego get in the way. This was an extraordinary opportunity for the firm and for Mark Pomarico, a talented young designer in the office. I believe that the diversity of our practice is an excellent way for young architects to gain a variety of experiences in a variety of project types. Mark has worked on the lobby of a high-rise residence hall, an urban multi-family project, an affordable housing project, a spec office building, and this museum. All but one are already complete, giving him the opportunity to learn also from their construction. Because we believe in training well-rounded architects, we like to see them experience all phases of a project. So even though Mark is primarily design oriented, we thought he would become a better designer if he had the experience of construction administration to see how his ideas translated into the field and what was required if his ideas were not delineated clearly enough in the documents. Nothing teaches you faster to document your ideas clearly than three or four burly guys standing there with tools going, “come on Mr. Architect, what do you want us to do with this? And the clock is running.” Below is Mark’s story in his words. Enjoy the read, while I enjoy a month off. Having worked at DiMella Shaffer for three years as a designer, I have enjoyed a diverse range of experience on the various stages of our projects as Ed noted above. For the McMullen Museum, I joined the team at the beginning of Design Development and was primarily focused on the development of the new addition and especially the main open stairway. In construction, I was given the opportunity to work alongside David Godfroy and Jessica Schulte to help make our vision a reality. In 2012, Boston College was presented with a unique opportunity to expand and relocate the McMullen Museum of Art to a more prominent location on the College’s 65-acre Brighton Campus. We explored several options for where to put a building, however, it was ultimately decided to renovate the former Cardinal’s residence to house the museum. Built in 1927 by the architectural firm Maginnis and Walsh, this Renaissance Revival palazzo was acquired by Boston College in 2004 from the archdiocese of Boston. The harmony of the Palazzo’s intricate Renaissance detailing and the McMullen Museum’s art collection was very appealing to the design team. 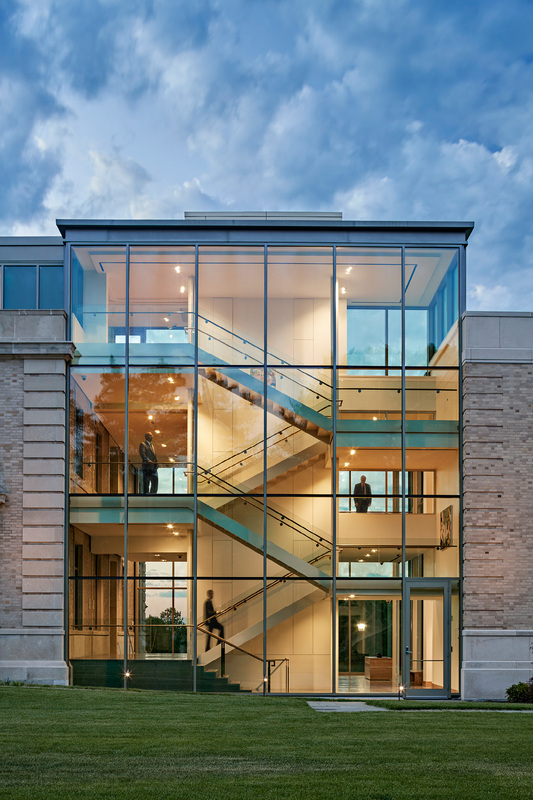 The 6,000 SF addition and 23,000 SF renovation was completed in March 2016 and includes a light–filled, glass addition with a new elevator core and monumental stairway, offering expansive views to the formal lawn and surrounding grounds. The new entrance lobby is also home to the 127-year-old stained glass triptych by well-known American artist John La Farge. Additionally, accessibility is provided to all levels of the renovated existing building. The second floor features the main gallery, with moveable partitions that allow flexibility to adapt the space specifically to each exhibition. An open-plan sculpture gallery on the third floor compliments a smaller gallery and rooftop terrace. The historic building entrance was preserved to create the University Conference Center on the first floor; support spaces, such as the catering kitchen and art storage, are located in the basement. There were numerous challenges involved in adapting this historic building into a museum. Our intent in designing the addition was to complement and give new life to the existing structure rather than overshadow it. To achieve this, we designed the new entrance as glass and exposed the delicate steel frame which supports it. The East elevation of the existing palazzo is seen through the addition and the steel and glass combine harmoniously as a light and airy counterpoint to the heavier masonry. One of the technical challenges was the need to maximize ceiling heights and not impact the structure. 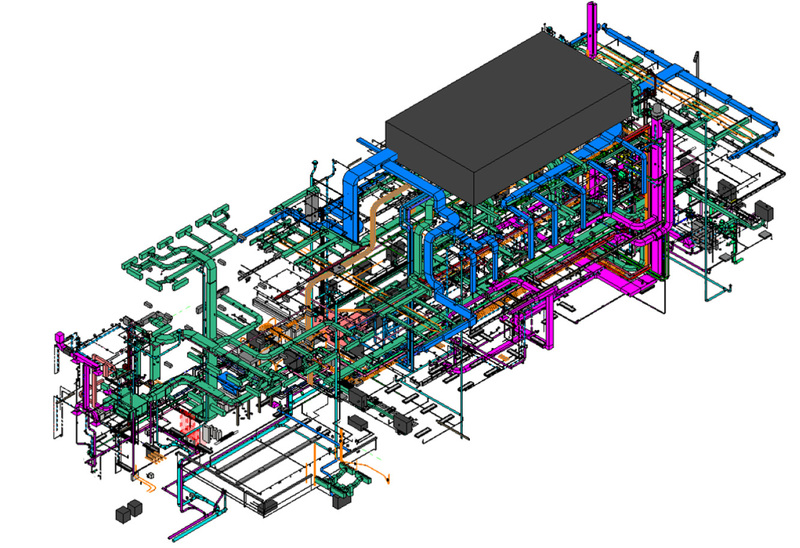 This required a laser scan of the existing structure to coordinate the dense network of mechanical systems in a 3D BIM model. Additionally, the roof at the west end of the second floor gallery was raised to provide a taller gallery that accommodates the larger works in the University’s collection. Designing the interior climate to maintain a constant temperature of 70 degrees and 50 percent humidity was challenging due to the negative impacts of humidity on the existing mass wall construction. An innovative envelope design strategy involved creating an air space between the existing exterior brick and new gallery walls that also served as the return air plenum, ventilating the existing structure and helping meet the critical humidity levels required in galleries. There is something incredibly beautiful about restoring and renovating a building of this stature. 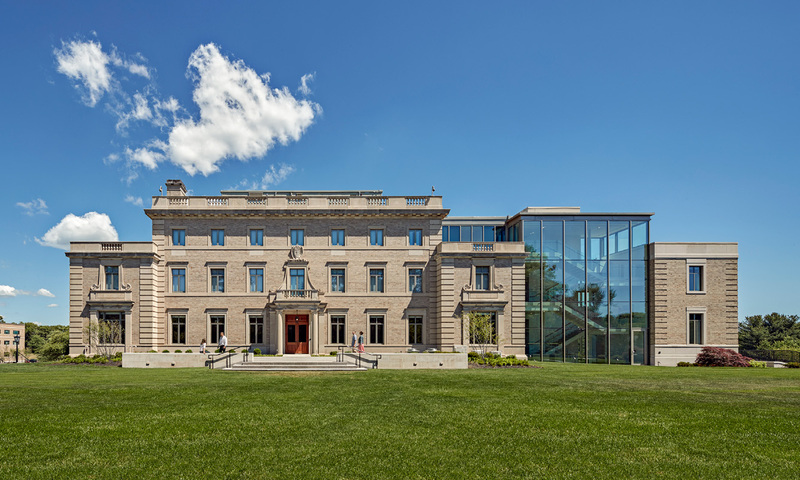 Like our renovation of St. Mary’s Hall at Boston College, this project required a team of skilled masons to clean, take apart, and restore the details on the existing building. 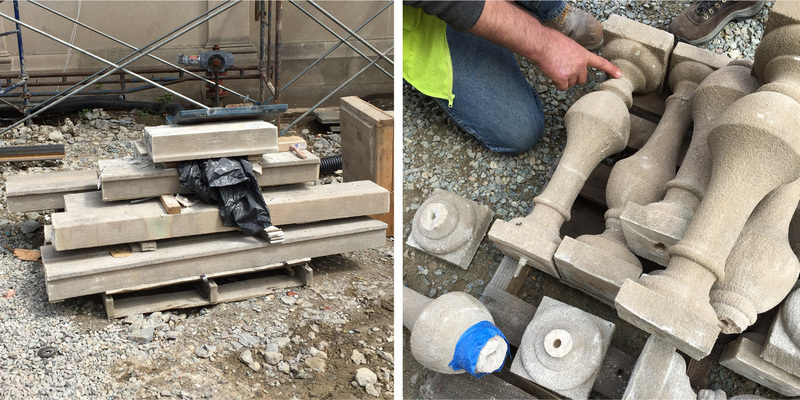 At moments during construction, the site was a catalog of stone details. 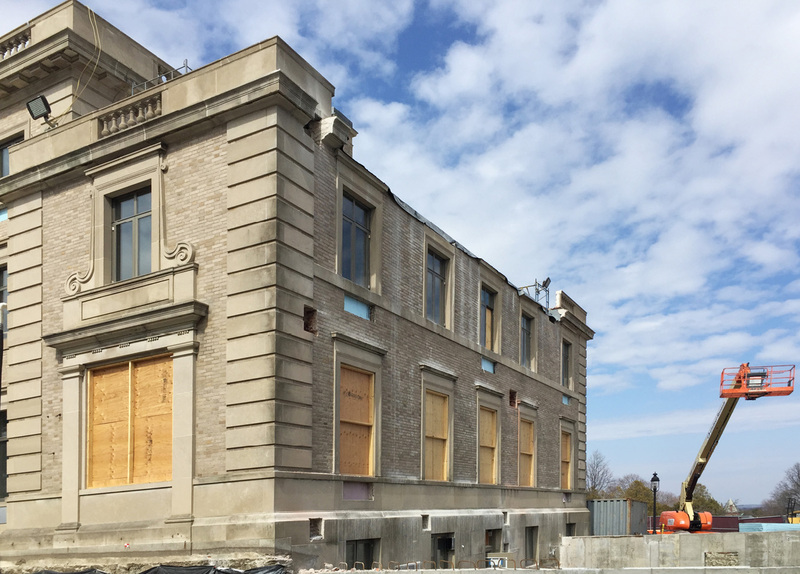 There was a point in time when the East façade of the building was cut apart with large sections of the parapet removed in preparation for the new beams to be installed. This moment could be likened to a caterpillar malting and preparing to be transformed into a butterfly. It is slightly disturbing to see the façade of such a beautiful building cut apart, but you know it is all in preparation for a metamorphosis. As construction begins, there are many weeks of tedious site work, excavation, and demolition. Once these initial aspects of the schedule are complete, the transformation is ready to begin. 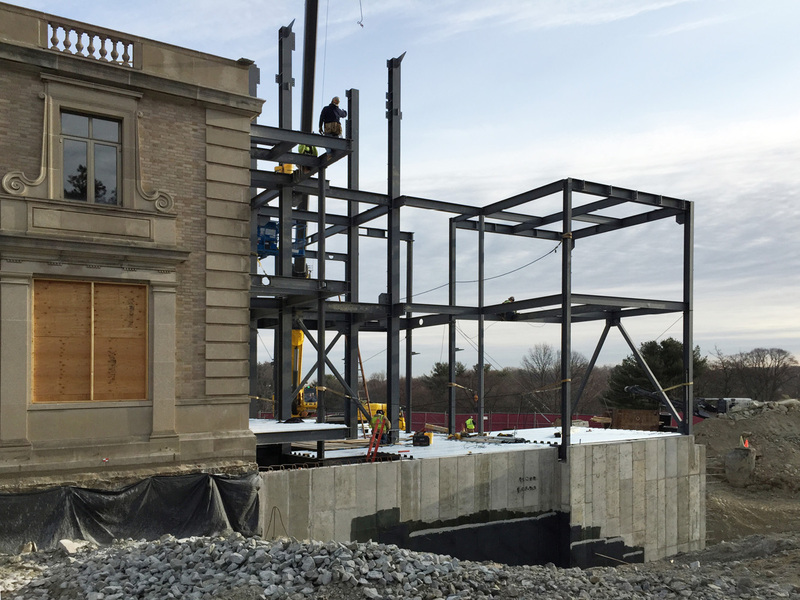 This picture below captures the steel frame being erected and interfaced with the existing building. Seeing the bare columns and beams reaching towards the sky, yet to be connected by the floor decking was an incredibly poetic moment. As an architect you cherish these fleeting stages of the metamorphosis. I learned several important lessons during construction. Many were amplified by the fact that we were working on a renovation with tight tolerances to fit the program and systems into the existing building. The other factor was the use of the building as a museum. Our team was required to creatively solve unforeseen conditions so that the solutions were invisible. A successful art gallery is one that becomes a background to the art on display. The personality of an architect as a compulsive organizer of space and function really comes out in a museum. In construction, I learned about the clarity that our documents must have to depict our intent. In construction drawings, vagueness almost always leads to disappointment. There are often multiple construction trades that touch a single detail, so anything that is left up for interpretation will most likely not be solved as we intended. In construction, you learn to think like a contractor and adapt to communicate accordingly. I also learned the importance of construction tolerance. One of my main responsibilities through the design and documentation of the project was the monumental stair on the south façade of the addition. The stair and exposed cruciform columns that support it are tightly integrated. I will never forget the day these stairs were lifted and set in place. 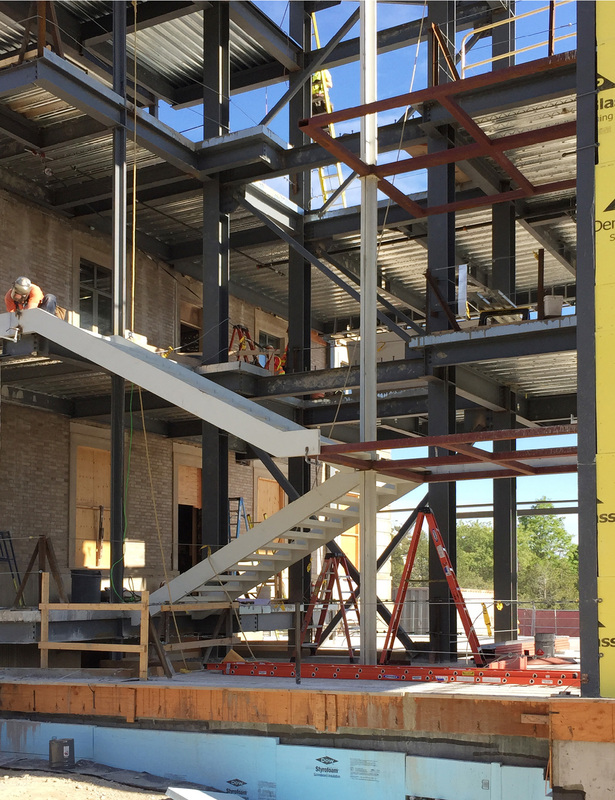 It was disturbing that the stairs did not initially align with the steel columns as the shop drawings depicted. It had not occurred to me until that moment that this alignment required the cruciform columns to be perfectly straight over 3 stories. Luckily, our construction team understood this concern and found a solution to achieve the desired alignments. I recall a discussion with David Godfroy, my project manager, regarding tolerances. While we were conversing, there was a hammering sound to the left. One of the steel columns that support the roof was being nudged into place. It was an epiphany for me that the accuracy with which we draw is not always achievable in the field. Details must have tolerance built-in to allow for construction and unforeseen circumstances. The translation of two-dimensional drawings to built form can be likened to learning a foreign language. In Spanish class you learn the correct grammar and practice conversation in a vacuum. It is rare for most students to take a foreign language and be able to think fluently in this language. Most students must study abroad with a host family and immerse themselves in the language to get beyond this hurdle. The same is true for learning the language of construction. Being on site week in and week out is what it takes to become fluent in this language. By observing the evolution of a detail and working with the different trades on site to solve problems and communicate our design intent, one must constantly look back and forth between the proposed details and the actual built condition. Doing this enough and an epiphany occurs! Back in the office, you are picturing the sequencing of the construction and the layers of materials coming together. As Ed has expounded upon in his previous blog posts, DiMella Shaffer is a firm that takes pride in producing quality designs for our clients, which are constructed at the highest level. In my experience thus far at DiMella Shaffer, I value the focus on training young staff to become well rounded architects and develop hands-on skills at the various stages of a project. The goal in expanding and moving the McMullen Museum of Art into their new home was to create a strong identity and enable their programs and exhibits to become accessible to a much larger audience. We are pleased to have had a hand in designing a state of the art facility for them to achieve their ambitions and make the campus a more enjoyable place for students, faculty and visitors. Mark, I very much enjoyed reading about your experiences in designing and participating in the construction administration of this very beautiful addition to this historic BC. building. It brings me great pleasure to see that DiMella Shaffer continues to embrace the concept of developing “complete” young architects by making sure that their designers continue to learn and benefit from being involved in the construction administration process. Congratulations to the learners and the teachers!